Russian kickboxing star Batu Khasikov is now a fully-fledged member of the fight game elite. On Saturday, Batukhan, who beat Albert Kraus earlier this year, claimed a victory over another K-1 great, “Iron” Mike Zambidis. 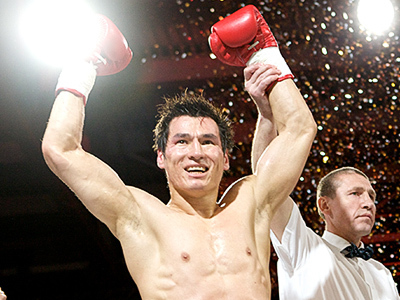 ­Treat every fight as if it's the fight of your life is the creed by which Batu Khasikov has lived his entire career. That culminated in the biggest bout of all in Moscow on Saturday as Russia's top welterweight kickboxer challenged one of the toughest men in the business, reigning W5 champion Mike Zambidis. The Greek was the second K-1 legend to test the 31-year-old. In March, Khasikov made his way up the ladder by beating Albert Kraus via a unanimous decision. This time around he did not wait around. Zambidis is also known as “Iron” Mike. But Batukhan proved to be made of something even stronger on the night. One of his dangerous knees forced Zambidis to give up the fight due to a jaw fracture early in the first round though it was not exactly clear when the crucial hit came. “My plan for the fight was to make Mike constantly move and not let him stay firm on his feet. That's where he's extremely dangerous, punching very hard. But when it comes to knees and low kicks, well, that's where I'm strongest,” the beaming Batu said. So who is next for Batukhan? That question is yet to be answered, although the fighter himself knows what he wants. “My point of view is that the very best K-1 fighters should keep coming to Russia to show what they have to offer. Now I can fight on my own terms and not have to travel as much,” he noted. The initial assumption that Zambidis’s jaw was broken during the bout was confirmed on Sunday. “In first place, he came to Moscow for victory, and not for the money,” the promoter added. The Greek fighter has refused hospitalization in the Russian capital and has already returned home to undergo treatment. Meanwhile, the organizers promised to release the broken jaw X-ray to avoid further speculation.